If I wanted to teach my child about the Columbia River Gorge, that 80-mile canyon that stretches between Oregon and Washington, where multitudes of waterfalls – including Multnomah Falls – pour into the westward-bound Columbia River, we could head over to its Wikipedia page and read about its geological history. “The Columbia River Gorge began forming as far back as the Miocene, (roughly 12 – 17 million years ago), and continued to take shape through the Pleistocene, (700,000 – 2 million years ago),” we would read. “During this period the Cascades Range was forming, which slowly moved the Columbia River’s delta about 100 miles north to its current location. Although the river slowly eroded the land over this period of time, the most drastic changes took place at the end of the last Ice Age when the Missoula Floods cut the steep, dramatic walls that exist today, flooding the river as high up as Crown Point. This quick erosion left many layers of volcanic rock exposed.” All correct of course, (although some may argue the validity of such claims), but that is very dry information. We could dive into more detailed history of the geology, such as Cataclysms on the Columbia: The Great Missoula Floods or Bretz’s Flood: The Remarkable Story of a Rebel Geologist and the World’s Greatest Flood , or explore an imaginative take on the subject in the graphic novel Terra Tempo: Ice Age Cataclysm! But there is another perspective to consider. Long before geologists explored the canyon, wrote down observations, took measurements, and postulated theories of its origin, and long before there were Washington and Oregon states or the city of Portland, there were people who called this place home. The Native American history of the region is just as important to learn about than what science tells us and what Euro-American history tells us. 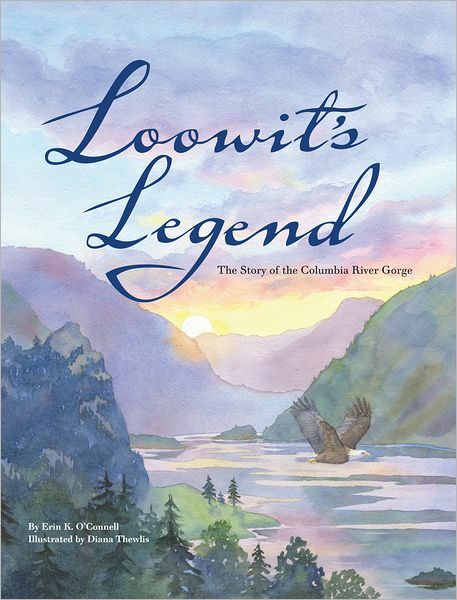 This brings us to Loowit’s Legend: The Story of the Columbia River Gorge , written by Erin K. O’Connell and beautifully illustrated by Diana Thewlis (Parallel45 Publishing, 2012, 29 pp., loowitslegend.com). This Native American legend tells the story of how Mt. St. Helens, Mt. Adams, and Mt. Hood – all volcanic peaks on the outskirts of the gorge – were created from Loowit and the brothers Pahtoe (chief of the Klickitats) and Wy’east (chief of the Multnomahs), respectively, by their father the Great Spirit. The Great Spirit disliked his sons Pahtoe and Wy’east’s constant fighting (even over the beautiful Loowit) and thus made sure they would fight no more by turning them into mountains. And he was thankful for Loowit’s service as a keeper of fire, and rewarded her with eternal life, also as a mountain. In this legend, as in most Native American legends, there is a strong connection between the characters and nature. The book shows the power of having a sense of place, a connection to a landscape, and telling a Native American perspective on this subject can do more, I think, than teaching just about facts and dates and numbers. You get a sense of how a place can really mean something to people, and Thewlis’s soft-toned paintings nicely captures the beauty of the gorge as I have experienced it on drives down I-84 and visits to Multnomah Falls. Another aspect of the book that is worthwhile is that children will learn where some place names come from, like Multnomah, or Bridge of the Gods. The endpages include a nice map of the gorge, for reference, and some information about Native American petroglyphs and pictographs that can be found in the gorge. If I were to nitpick, when I heard of the book and got a review copy, I was expecting to read a Native American story about the origin of the gorge itself, and since the legend deals with various volcanic peaks, and not the canyon itself, the title may possibly be misleading to some. But all in all, this is a very beautiful book with a simply-told and appropriately illustrated story that will give young readers another perspective on a Pacific Northwest landscape. This entry was posted in books, columbia river gorge, geology, mt. hood, mt. st. helens. Bookmark the permalink. Thanks, Katie, for sharing! This book should be in every library in the state.